Nexus 6P, announced on September 29, 2015, is a pure Android device from Huawei that features 5.7-inch WHQD display, running Android 6.0 Marshmallow. The first all-metal-body Nexus phone, it was announced alongside the Nexus 5X. When you debug the Nexus 6P, you get access to the developer mode which provides you with more tools and customization options compared to the standard mode. You are able to use some third-party tools to better manage your phone (for example, Syncios Mobile Transfer). 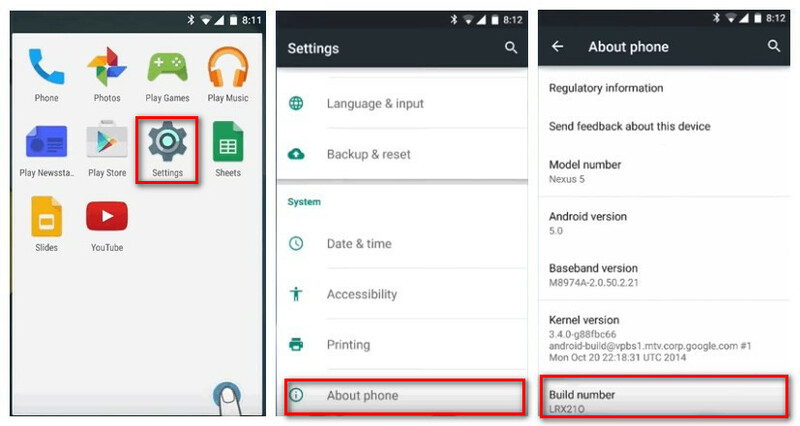 Now, please follow these steps to debug your Huawei Nexus 6P. :Unlock your phone and go to Settings. : Under Settings, scroll down and open About phone. : Under About phone, find Build Number and tap seven times on it. After tapping seven times on it, you will get a message on your screen that "you are now a developer". That’s it you have successfully enabled developer option on your Google Nexus 6P. : Select on the Back button and you will see the Developer options menu under System, and select Developer options. : Slide to check the “USB debugging” to “On” and you’re ready to use your device with developer tools. : After finished all these steps, you have successfully debuged your Huawei Nexus 6P. Next time you connect your phone to computer using a USB cable, you will see a messages “Allow USB Debugging” for allow a connection. 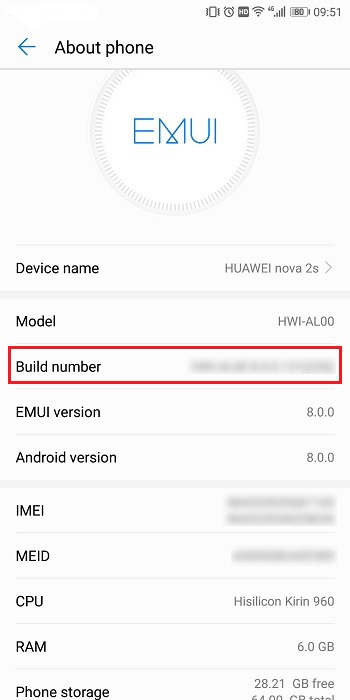 Now, please follow these steps to debug your Huawei Nova 2S. : Turn on your Huawei Nova 2S. 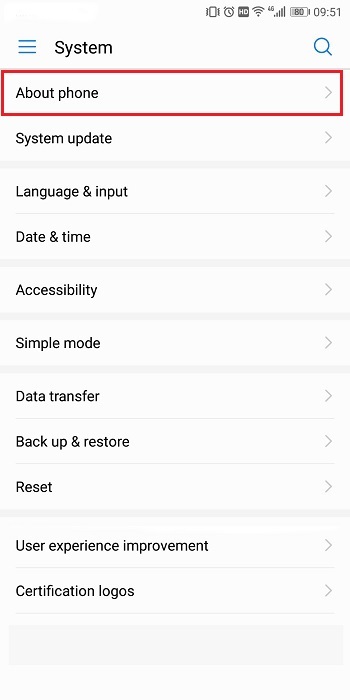 : Go to your Huawei Nova 2S Settings option. : Under Settings option, select About phone. : Scroll down the screen and tap Build number several times until you see a message that says "You are now a developer!". : Select on the Back button and you will see the Developer options menu under Settings, and select Developer options. : Slide the "Developer Options" button to "On" and scroll down to open "USB debugging". : You will see a message "Allow USB Debugging", click "OK". 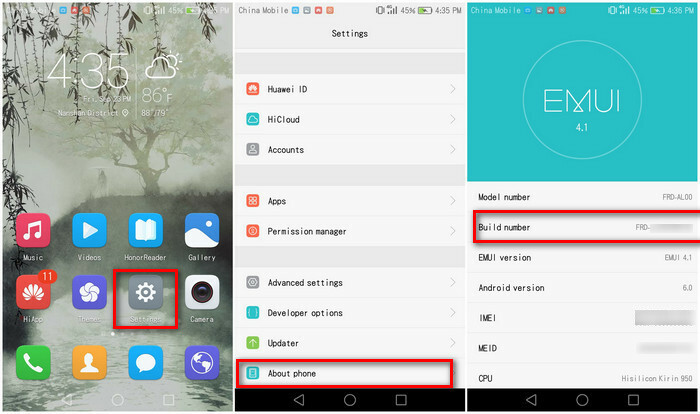 Now, please follow these steps to debug your Huawei Mate 7/8. 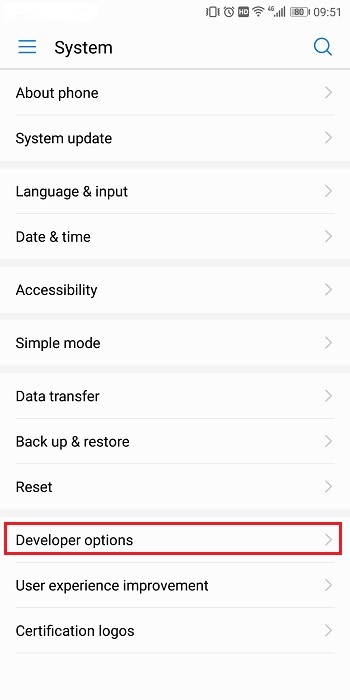 : Turn on your Huawei Mate 7 or Huawei Mate 8.
: Find and open "Settings" option. : Select "About phone", at the bottom of the interface. : Tap "Build number" almost seven times you will see a prompt “Developer mode has been enabled“. : Back to setting panel where you can see the "Developer options", select Developer options. : Slide to turn the “USB debugging” on, and you can use your phone as a developer. : With all these steps done, you have debuged your Huawei Mate 7 or Huawei Mate 8 successfully. Tips: Everytime you connect your Huawei phone to computer with the USB cable, pay attention to the prompt and tap "OK" to allow USB Debugging. Now, please follow these steps to debug your Huawei Ascend Phone. You will get a message on your screen that "you are now a developer". Then you have successfully enabled developer option on your Huawei Ascend Phone. : Slide the “USB debugging” button to “On” and you’re ready to use your device with developer tools. 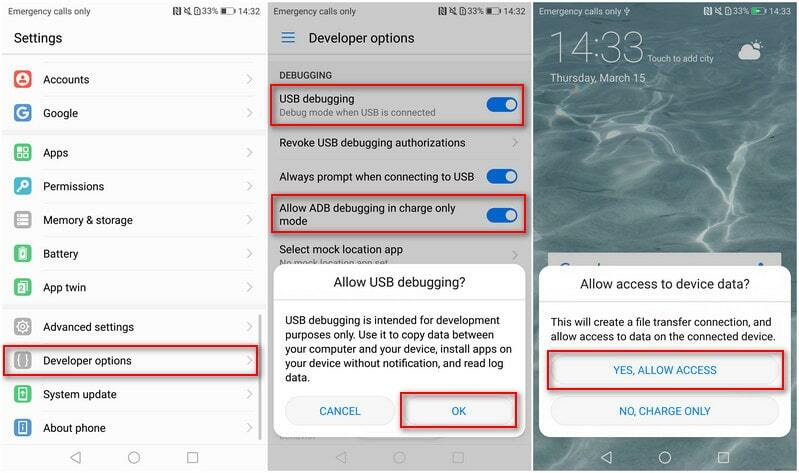 : After finished all these steps, you will see a messages “Allow USB Debugging” for allow a connection, click OK.
Now, please follow these steps to debug your Huawei P10/P10 Plus. : Turn on your Huawei P10/P10 Plus, go to Settings. : Enable "USB debugging" mode, there will be a pop-up "Allow USB debugging? ", click "OK". : Connect your phone to computer, you will see "Allow access to device data? ", click "YES, ALLOW ACCESS". 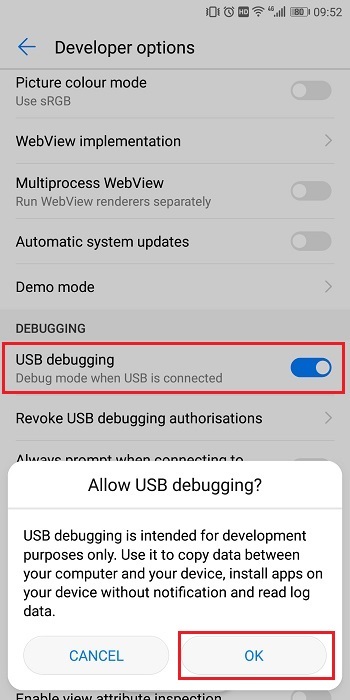 TIPS: sometimes you may noticed that when you connect your Huawei devices to computer, the USB debugging mode have been automatically disabled. Then please enable the "Allow ADB debugging in charge only mode" under debugging options. That's all! Now you can connect your HUAWEI P10/P10 Plus device to computer and backup your Huawei P10/P10 Plus. 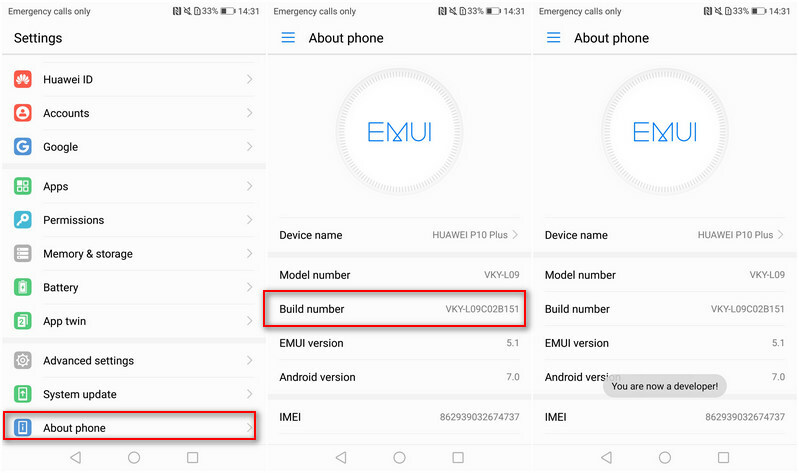 Now, please follow these steps to debug your Huawei P20/P20 Pro. : Turn on your Huawei P20/P20 Pro. 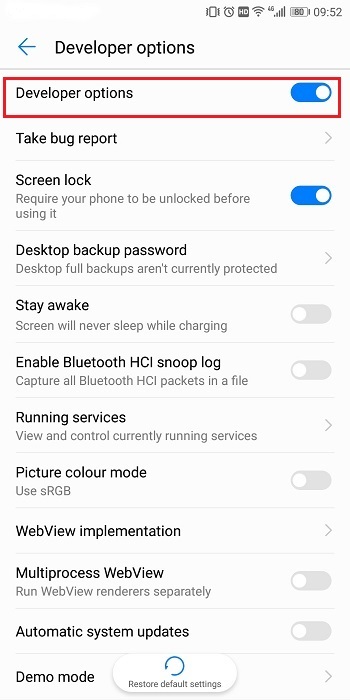 : Go to your Huawei P20/P20 Pro Settings option. 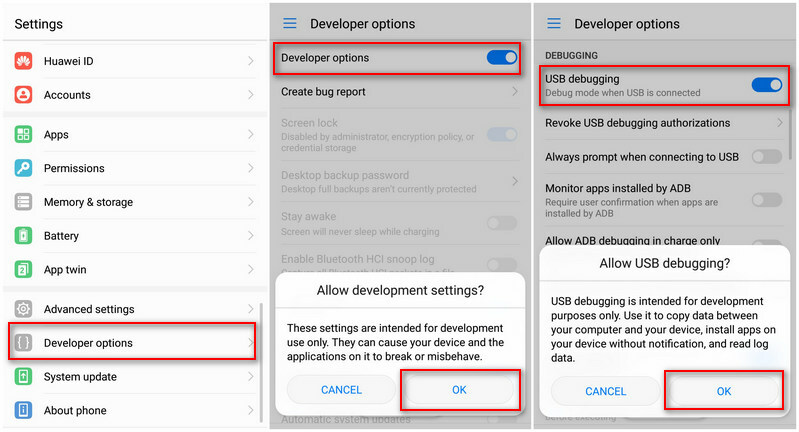 Now, please follow these steps to enable USB debugging mode on your Huawei Honor 9.
: Unlock your phone and go to Settings. : You will get a message on your screen that "you are now a developer". 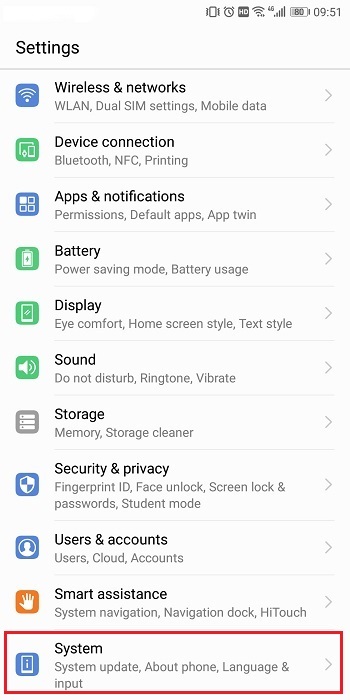 Then you have successfully enabled developer option on your Huawei Honor 9.
: Select on the Back button and you will see the Developer options menu under Settings. : Enable Developer options. Click "OK" when you see "Allow development settings?". : Enbale the "USB debugging" option, click "OK" when you see "Allow USB debugging?". That's all. Now you have successfully enabled USB debugging mode on your Huawei Honor 9. You can connect your device to computer and backup your phone data. 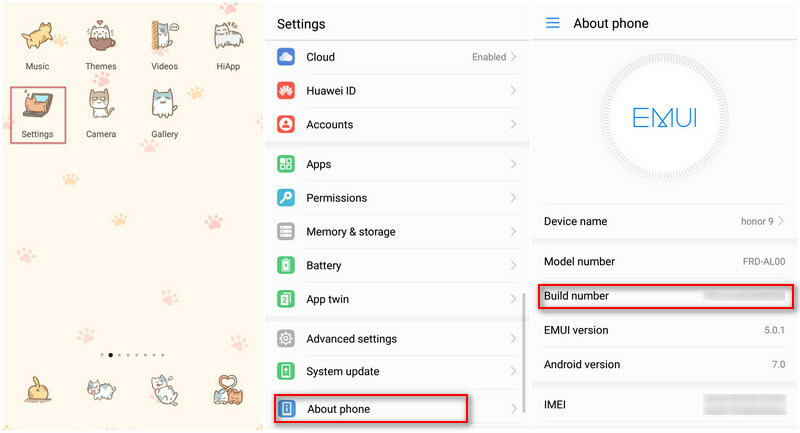 Now, please follow these steps to debug your Huawei Honor 6/7/8. After tapping seven times on it, you will get a message on your screen that "you are now a developer". 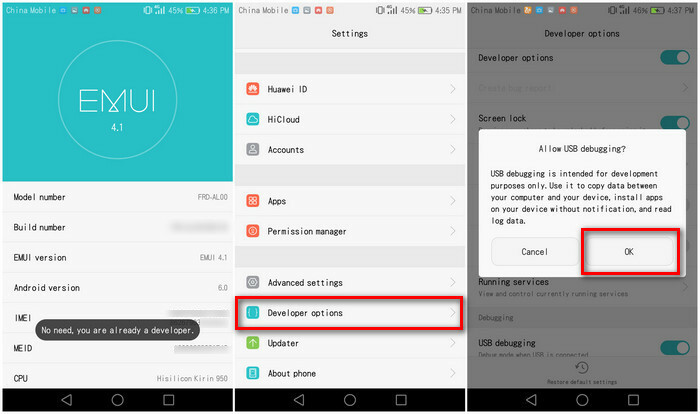 That’s it you have successfully enabled developer option on your Huawei Honor 6/7/8. : After finished all these steps, you have successfully debuged your Huawei Honor 6/7/8. 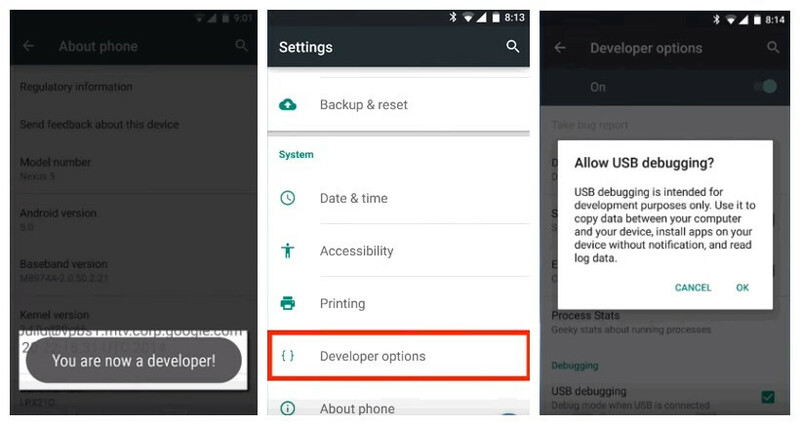 Next time you connect your phone to computer using a USB cable, you will see a messages “Allow USB Debugging” for allow a connection, click OK. Or you can directly slide USB debugging to "On" under developer options.